With all the rain the past few weeks I feel a bit like the Weather Channel. We just had our second serious monsoon type summer storm here in the Imperial Valley and it was a real doozie! This information should be most useful for visiting birders and explorers intending to visit our desert playground this coming weekend as far as road conditions and into the near future for desert greenery and wildlife conditions. First, a few facts taken from the front page of our local Imperial Valley Press. I was in the 2″ part of the El Centro portion and was reminded of Forrest Gump’s statement that sometimes it even seemed to fall up. Kayaking would have been possible on many streets in the valley that night. Rain is such a unique event here in the desert that it seems to bring out the smiles on every person you meet at a doorway as they come rushing in. The biggest smiles were probably mine though. Most of the roads to birding sites should be accessible by next weekend with certain precautions. Do not get off to the sides or shoulders on the dirt roads and don’t go down it if you do not see vehicle tracks of someone else successfully going down it before you! Many of the dirt roads near the Salton Sea are very alkaline and can be very slick just from heavy humidity the night before. Davis Road from the Wister Unit of the Imperial Wildlife Area is exceptionally prone to that. The Finney and Ramer Lake Units should just be avoided for at least another week as the goop gets really bad there. Birding the seawall in both directions from the intersection of Lack and Lindsey Roads would offer the best birding on this shore ot the Salton Sea. Yellow-footed Gull should be easily seen along that stretch. The west end of Bowles Road might not yet be accessible by next weekend but if it is you will want to go there. An adventurous group of birders from the Anza Borrego Foundation, under the fearless leadership of the “Dorks looking for Storks” made a trip to the Salton Sea on Tuesday morning. Their trip started out with a detour as they made it all the way from Borrego Springs to Ocotillo Wells and ran into the Hwy 78 closure so had to backtrack to the Borrego Salton Seaway. They did pretty well for only being able to get to a few places and they did get to see their Wood Stork by getting their feet muddy and walking the last bit from Garst Road at the Alamo River to view Morton Bay. I followed the Doppler radar very closely during the storm and am very excited about the amount of rainfall in the deserts north and east of the Algodones Dunes. Sure wish I could get out there for a night trek in the dunes. I would wager there are still some pretty good size lakes still standing in the pockets even today. Two major storms in as many weeks have run some serious water up against those dunes to be trapped in the “pockets” and I expect there to be some great birding and nature study out there this fall. 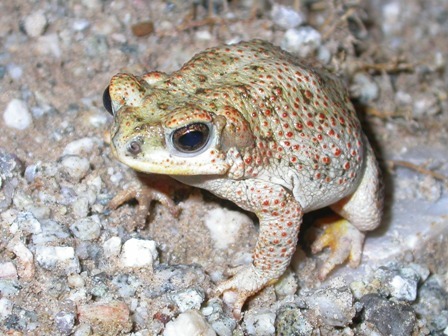 Storms like this in the desert bring out Red-spotted Toads in mass quantities as they seem to appear out of nowhere. This one was photographed in the Algodones Dunes during a major summmer thunderstorm on August 26 , 2010. Well, that’s my rambling for the week. See ya at the sea………………..